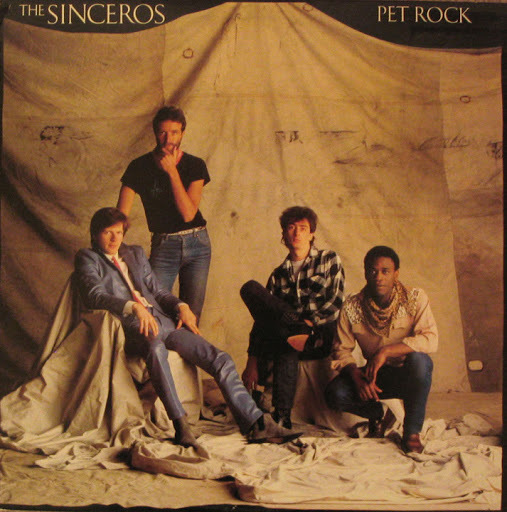 Ages ago I posted a couple of tracks by The Sinceros, a band I only knew for two magnificent songs in 1979 (the two tracks I posted). The reason I mention that is because Michael, the Regular Suggester Of Horrid Songs From The 1980s, has offered a song by The Sinceros this week. 0:00-0:17 – Oh, man. This is wonderful. I think this a magnificent start to the song. It may be a bit too low-voltage for a New Wave / Power Pop song (The Sinceros were considered a new Wave / Power Pop band), but I don’t care. I think the melodies are superb, the instrumentation ideal for them, and the production eminently suitable for this kind of music (i.e., mid-tempo pop). Great chord choice at 0:23. 0:25-0:32 – The third half of the introduction / chorus, and it’s a repeat of the first half. Splendid. 0:32-0:47 – Here’s the verse. (I think.) I like the vocal melody, but I’m not keen on the instrumental backing. I’m guessing the band decided to change things up a bit, and not have the whole song in a smooth, steady, mid-tempo beat. I don’t find it very convincing as a musical device to break the potential monotony. I can image something else for the instrumental backing, something involving palm muted arpeggios from the guitar, and a bit of slap from the bass. But the song’s already been recorded, and not by me (and not this week). But I do like the vocal melody. When Michael sent me “Falling In And Out Of Love”, he asked if I could shed any light on a mystery sound in the verse, from 0:33-0:43. It’s a short sound, it’s in the left channel, and it appears at regular intervals. As far as I can tell, it’s a synthesizer that’s been programmed to emulate a flute. That’s what it sounds like to me. 1:03-1:11 – The not-as-wonderful second-half of the chorus. But this time the band plays it more dramatically, and I think it improves it. And at 1:09 there’s that great chord again. 1:11-1:18 – The third-half of the chorus again. Mmm. 1:18-1:34 – Another verse. It’s not that much different to the first verse, so whatever I said about it earlier please place that here. Thank you. 1:34-2:01 – Another chorus. Oh yeah. 2:01-2:09 – This is the first part of the chorus being repeated ad infinitum as the band motors its way to the end of the song. The thing I love about this end section is the backing vocals: they sing the phrase “In and out of love” angelically, and with a cute little “love!” at the end of it. Excellent. 2:09-2:16 – A nice, semi-dramatic finish to the song. But I thought the fade was way too quick. I like this song enormously. Thanks, Michael, for picking a non-dud song this week. Song of the day: The Sinceros – "Worlds Apart"
That was the band’s second single. Wikipedia tells me that The Sinceros released six (!) singles in total. I have no idea why, because I thought after “Worlds Apart” had failed to burn up the charts the band disappeared off the face of the Earth. But at least they released two albums: The Sound Of Sunbathing (1979); and Pet Rock (1981). I love Ron’s bass playing, and “Heaven (Must Be There)” is a mighty decent pop song. You are currently browsing the archives for the Sinceros category.